The majority of previous studies have observed an increased risk of mucinous ovarian tumors associated with cigarette smoking, but the association with other histological types is unclear. 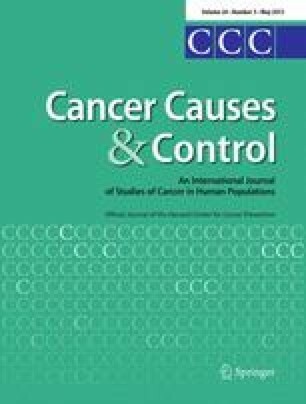 In a large pooled analysis, we examined the risk of epithelial ovarian cancer associated with multiple measures of cigarette smoking with a focus on characterizing risks according to tumor behavior and histology. We used data from 21 case–control studies of ovarian cancer (19,066 controls, 11,972 invasive and 2,752 borderline cases). Study-specific odds ratios (OR) and 95 % confidence intervals (CI) were obtained from logistic regression models and combined into a pooled odds ratio using a random effects model. Current cigarette smoking increased the risk of invasive mucinous (OR = 1.31; 95 % CI: 1.03–1.65) and borderline mucinous ovarian tumors (OR = 1.83; 95 % CI: 1.39–2.41), while former smoking increased the risk of borderline serous ovarian tumors (OR = 1.30; 95 % CI: 1.12–1.50). For these histological types, consistent dose–response associations were observed. No convincing associations between smoking and risk of invasive serous and endometrioid ovarian cancer were observed, while our results provided some evidence of a decreased risk of invasive clear cell ovarian cancer. Our results revealed marked differences in the risk profiles of histological types of ovarian cancer with regard to cigarette smoking, although the magnitude of the observed associations was modest. Our findings, which may reflect different etiologies of the histological types, add to the fact that ovarian cancer is a heterogeneous disease. The work was supported by the European Commission’s Seventh Framework Programme grant agreement no. 223175 (HEALTH-F2-2009-223175). It was also supported by the National Institutes of Health (R01 CA074850, and R01 CA080742 [CON], R01 CA112523, and R01 CA87538 [DOV], R01 CA58598, N01 CN55424, and N01 PC67001 [HAW], R01 CA95023 [HOP], R01 CA61107 [MAL], R01 CA122443, and P50 CA136393 [MAY], R01 CA76016 [NCO], R01 CA54419, and P50 CA105009 [NEC], K07 CA095666, R01 CA83918, and K22 CA138563 [NJO], U01 CA71966, R01 CA16056, K07 CA143047, and U01 CA69417 [STA], R01 CA106414 [TBO], R01 CA063682, R01 CA063678, and R01 CA080978 [TOR], CA 8860, CA92044, and PSA 042205 [UCI], CA17054, CA14089, CA61132, and N01-PC-67010 [USC]); Danish Cancer Society (94 222 52 [MAL]); Mermaid 1 (MAL); German Federal Ministry of Education and Research, Programme of Clinical Biomedical Research (01 GB9401 (GER); German Cancer Research Center (GER); U.S. Army Medical Research and Materiel Command (DAMD17-01-1-0729 [AUS]); National Health & Medical Research Council of Australia (AUS); Cancer Councils of New South Wales, Victoria, Queensland, South Australia, and Tasmania (AUS); Cancer Foundation of Western Australia (AUS); National Health and Medical Research Council of Australia (199600 [AUS]); Department of Defense (DAMD17-02-1-0669 [HOP], DAMD17-02-1-0666 [NCO], W81XWH-10-1-02802 [NEC], and DAMD17-98-1-8659 [TBO]); The Cancer Institute of New Jersey (NJO); Radboud University Nijmegen Medical Centre (NTH); Intramural Research Program of the National Cancer Institute (POL); Roswell Park Alliance Foundation (RPI); Cancer Research UK (C490/A10119, and C490/A10124 [SEA]); National Health Research and Development Program of Health and Welfare Canada (6613-1415-53 [SON]); American Cancer Society (CRTG-00-196-01-CCE [TBO]); Celma Mastery Ovarian Cancer Foundation (TBO); Lon V Smith Foundation (LVS-39420 [UCI]); Cancer Research UK (UKO, SEA); Eve Appeal (UKO); OAK Foundation (UKO); California Cancer Research Program (00-01389V-20170, R03 CA113148, R03 CA115195, and N01 CN25403 [USC]); California Cancer Research Program (2II0200 [USC]); and National Cancer Institute (P01 CA17054 [USC]). A portion of this work was done at UCLH/UCL within the ‘Women’s Health Theme’ of the NIHR UCLH/UCL Comprehensive Biomedical Research Centre supported by the Department of Health (UKO). The German group thanks Ursula Eilber and Tanja Koehler for competent technical assistance (GER). The Australian group thanks all the clinical and scientific collaborators and the women for their contribution (AUS). The cooperation of the 32 Connecticut hospitals, including Stamford Hospital, in allowing patient access, is gratefully acknowledged (CON). Some data used in the CON study were obtained from the Connecticut Tumor Registry, Connecticut Department of Public Health. The CON study assumes full responsibility for analyses and interpretation of these data. The MALOVA group is grateful to Nick Martinussen for data management assistance (MAL). The NJO group thanks Lorna Rodriguez, Lisa Paddock, and the staff at the New Jersey State Cancer Registry and Thanusha Puvananayagam for their contribution to the study (NJO). The SEARCH group thanks the SEARCH team, Craig Luccarini, Caroline Baynes, and Don Conroy (SEA). The UKOPS group thanks Ian Jacobs, Eva Wozniak, Andy Ryan, Jeremy Ford, and Nyaladzi Balogun for their contribution to the study (UKO).